It seems like we just welcomed in Autumn – and although the calendar says it will still be Autumn for a few more weeks, the chill in the air tells me that Winter is bearing down on the northeastern United States. Winter means many wonderful things, including WOOL season. 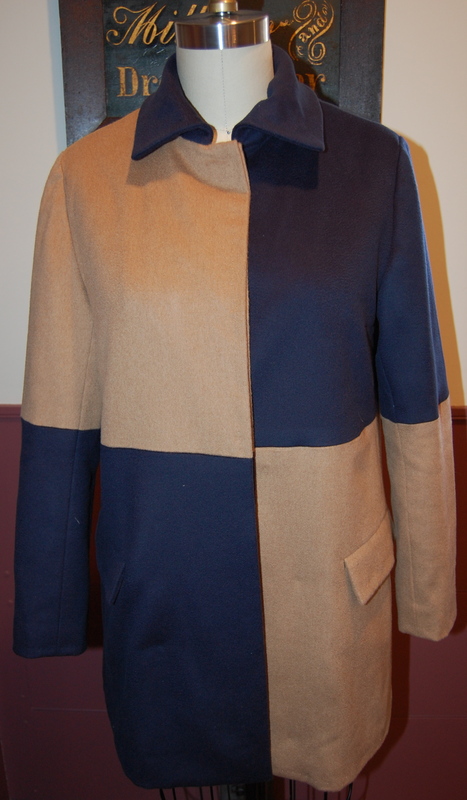 When I made my color-blocked coat last Winter, I purchased some extra yardage from Britex Fabrics with the thought of making a sheath dress to wear with it on occasion, but not exclusively with it. I wasn’t exactly sure what to expect. I knew that Marfy patterns come without seam allowances (the stitching line is the outside perimeter of each pattern piece), and in only one ordered size. One of the reasons I love vintage patterns so much is that they, too, were produced by particular size. (So that, for those of you who only sew from current multi-sized patterns, if you ordered a size 10, only a 10 was in the envelope.) Most vintage patterns include seam allowances, and the stitching line is marked as well. For those of us who use couture methods for our fashion sewing, having the stitching line marked is incredibly helpful. The stitching line is THE point of reference for alterations, for basting, for sewing. 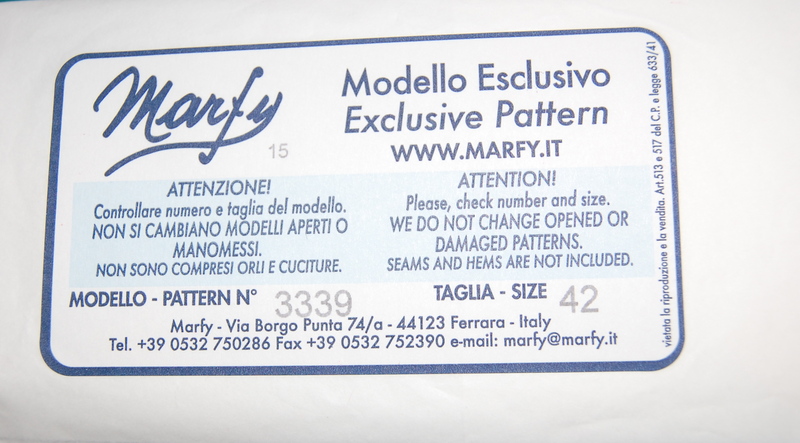 Knowing these two facts about Marfy patterns made me comfortable with the idea of sewing with them, even though they come with no written construction details other than a few notations on the pattern pieces. What I did not expect was the teeny tiny package in which the pattern arrived. The only identifying mark on the folded up pattern was the pattern number. I pressed the pattern pieces and got busy making my muslin (toile). From my adjusted muslin, which took the better part of a week to perfect (hopefully perfected, that is), I transferred sewing lines onto white silk organza underlining. (I will go into some of the changes I made in my next post on this dress.) In true couture mode, I then basted the organza onto the fashion fabric. It is always rewarding to sew the first “real” dart or seam! I feel like the dress is practically finished, although reality is sure to set in when all the finishing details start to occupy my time. The front, showing the seam detail which I like so much. Incentive to finish this wool dress is fanned by Winter winds to my back , by looming holiday sewing, and the excitement of finishing my first Marfy. To be continued, hopefully soon! It will be gorgeous dress! This is lovely dress indeed! I love these teeny tiny packages … I have got two not so long ago 🙂 Now it is time to find time to make muslins. I am really happy so far with this Marfy pattern! I suspect this won’t be my last one to make! Beautiful design and it compliments your coat. I love Marfy patterns and have used them for years. I now find it annoying to have seam allowances on patterns and cut them off immediately. Looking forward to the finished dress. I completely agree about those seam allowances! I really like the preciseness of this Marfy pattern – not unlike most vintage patterns. I’ve known of the name ‘Marfy’ for a while, but until now I had no idea how their patterns differed from most commercial patterns. 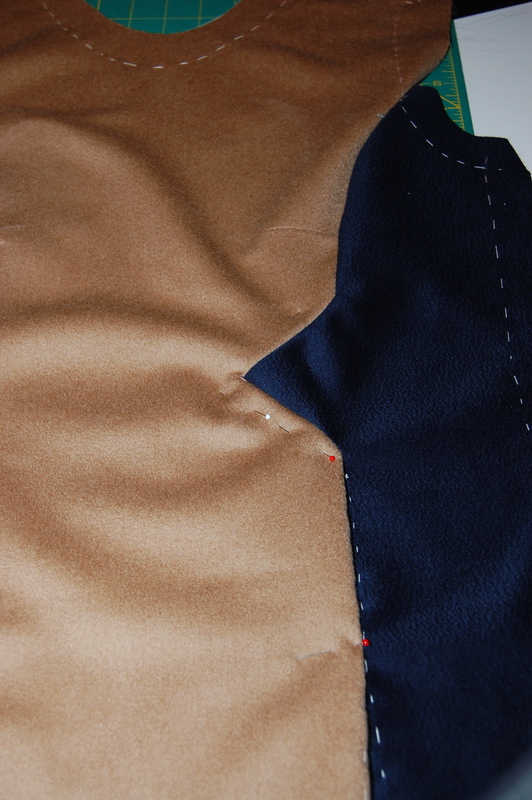 There have been times when I’ve wished that my seam lines were all marked out with running stitches – particularly when sewing a tailored jacket. 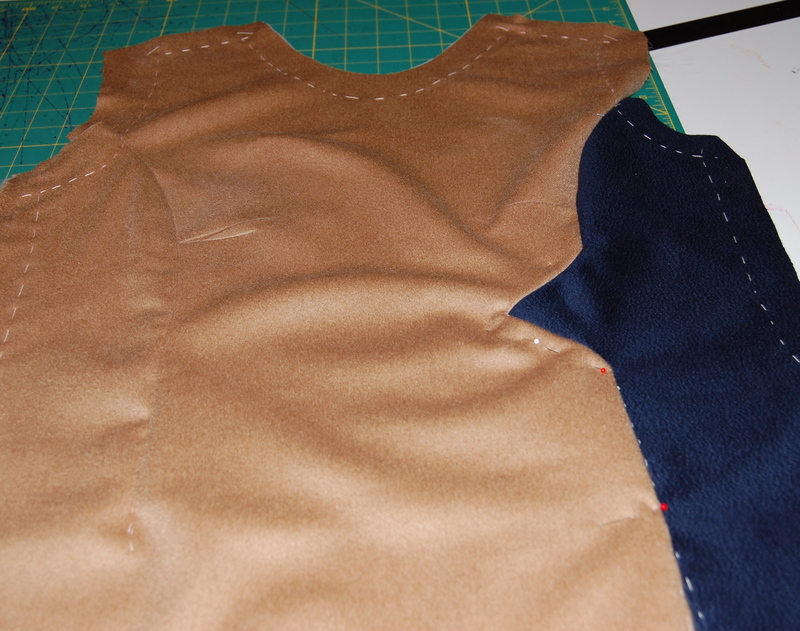 I actually have a difficult time sewing from new patterns – it seems counterintuitive not to have seam lines marked. So far, I would recommend Marfy. I think you and Marfy are a perfect match, Karen! Your expertise and execution paired with Marfy’s brilliant designs will produce a knock-out. I can’t wait to see it! So far I am finding this Marfy pattern quite wonderful to use. Of course, it’s a fairly simple design, so I can’t get into too much trouble (I hope!). Lovely design! Seems like I have a late 60s Vogue designer that is very similar. I’ll have to look. I wouldn’t be surprised. I’m sure I was drawn to this design because of its ’60s’ vibe! You have left us hanging! I can’t wait to see it finished! Hopefully soon, Linda! Thank you for your interest! Your dress is going to be quite lovely! I, too, have been so pleased with Marfy patterns after discovering them this past year. I recommend highly. I love the pattern you chose for your fabrics! I can’t wait to see your finished dress! I’ve sewn a couple of Marfy patterns and have maybe 5 in my pattern drawers. They really do have a nice retro style. And I love that they don’t have seam allowance – just like I’m used to working with in costume shops. My only complaint about Marfy designs has always been that the backs of the garments are often boring, like they just designed a new front for a stock pattern. That is such an interesting observation abut Marfy patterns, Brooke. That’s another thing I love so much about vintage patterns – so often the backs are as interesting as the fronts! One thing I noticed right away about this dress is that there are no shoulder darts on the back of the dress, which seem to be standard on most vintage dress patterns. Hoping to finish the dress today or tomorrow – it ALWAYS takes longer than I imagine!